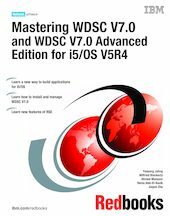 This IBM Redbooks publication discusses new features of WDSC V7.0, focusing on Remote System Explorer (RSE) and new ways of installing and managing the products. For features of the previous version, WDSC 5.1.2, refer to WebSphere Development Studio Client for System i Version 5.1.2, SG24-6961-01. - Integrated Development Environment: Seamlessly integrate all your tools, teams, assets, and other workbench-based projects. - IBM WebFacing Tool: Convert your existing 5250 interfaces to Web interfaces with minimal changes to the server application. - Remote System Explorer and System i Development Tools: Develop and maintain System i applications while working with remote systems. - Integrated System i Debugger: Debug code that is running on a System i machine.